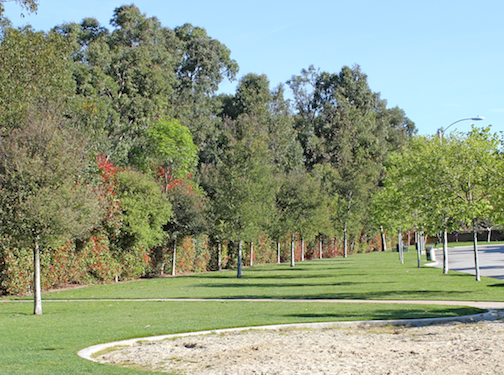 For my morning and afternoon walks, I choose from several loops, ranging from just under two miles to just over four miles. 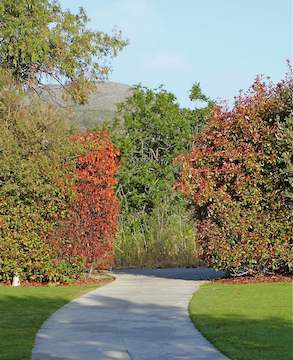 All the “loops” begin and end at my home, which is located near the western side of Ventura, California. 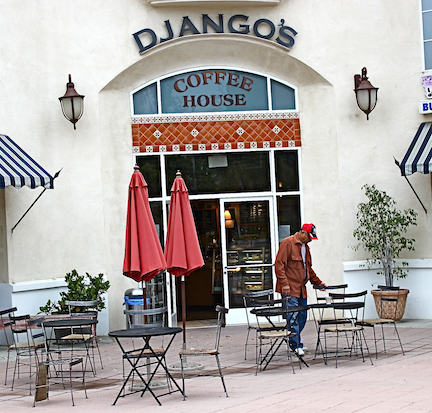 Most mornings, I take a path that leads to the Django’s Coffee House which is located near the mid-point of one loop that I call my “Django’s Loop”. Django’s Loop wanders through a variety of neighborhoods, including residential; industrial; retail businesses; and small undeveloped plots. 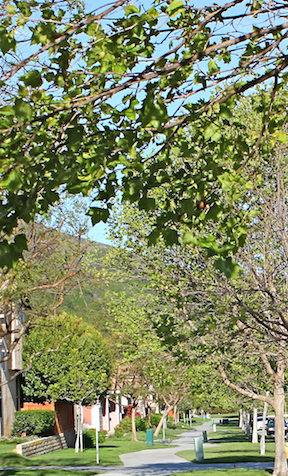 After finishing a cup of coffee at Django’s, I turn westward and follow a gently meandering sidewalk through a quiet residential neighborhood containing single family homes, condominiums and apartments. 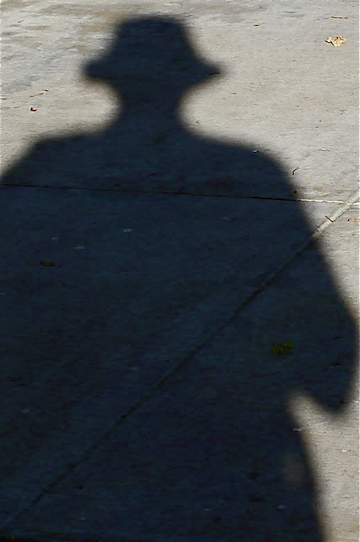 As I walk westward along this path with the morning sun behind me, my shadow, looking a bit like Darth Vader, precedes me on the sidewalk. The shadow and I pass a few small park-like settings . . .
. . . until the sidewalk ends at a “T” intersection with a blacktopped bike path that runs from the beach many miles inland to Ojai, and beyond. Here, I make a left turn and head southward toward home, following the blacktopped bike trail. The scenery changes rather abruptly after following the bike trail for a while, and soon passes near an industrial storage area which contains a potpourri of stored (discarded?) items of various sizes, from small hand tools to large tractor/trailer rigs and motor homes, as well as sealed shipping boxes containing < who-knows-what >. One item is the limp flag shown below . . .
. . . perhaps reflecting the current state of the economy. 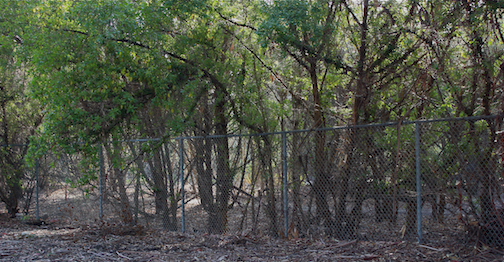 Next along the bike trail, I pass by a wild-looking wooded area . . .
After passing the wooded area I once again enter “civilization” with parking lots and street lights, all of which are not very photogenic . 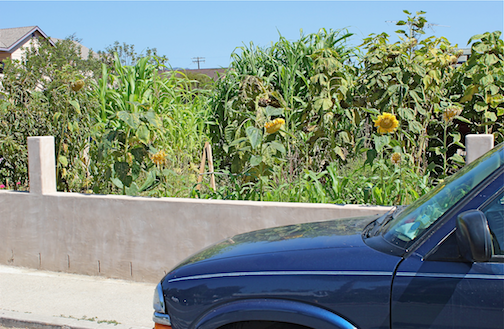 . .
Once past the street lights and parking lots, I am once again in a residential area where one innovative home owner along my path has created a veggie garden instead of a lawn between the house and the street. Not a bad idea, I think. 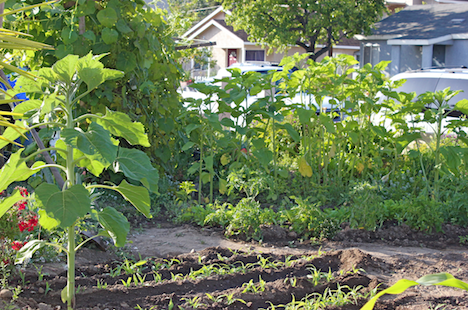 The photo, below, shows the veggie garden several weeks later . . . 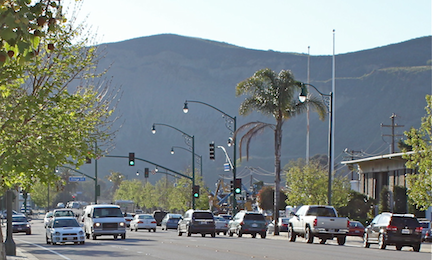 There is not a whole lot more to report regarding the homeward portion of my Django’s loop – just street intersections, light residential area traffic, and an occasional pet enjoying the morning shade . . . This entry was posted in Miscellaneous Musings and tagged Django's Coffee House, health, morning coffee, morning walk. Bookmark the permalink. Thanks for following my blog, and for liking some of my posts. Very great post. I simply stumbled upon your blog and wanted to say that I’ve really enjoyed browsing your blog posts. After all I will be subscribing in your rss feed and I hope you write once more very soon!